Whether you’re a gamer or music lover, having clear and consistent sound is essential if you want the best out of your devices. When you can hear the breathing of your virtual enemy or listen to the distinctive notes from your favorite instrument, your audio experience can elevate to a whole new level. Realistically, most of us can’t have our games and music blasting out of speakers all the time, especially during late night gaming or workout sessions. That’s why you need the best wireless headphones to help you stay immersed without being tied down by cords. Wireless headphones may vary in comfort, style, quality and functionality. The best wireless headphones will be constructed with excellent noise-cancelling technology; they should also be able to withstand frequent use without making your ears sore. In addition to having high-quality sound, they also need to have long-lasting battery life. Purchasing a great pair of wireless headphones can be a big investment; read on to learn about the important components of wireless headphones that you should consider before buying. 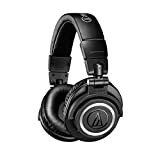 There are three primary form factors, or construction designs, of headphones that you can choose from depending on how you like to use and wear your headphones. On-Ear.. These headphones are generally smaller so that they can fit with the “donut” resting directly on your ear. On-ear headphones generally have a classic-style appearance and portray the feeling of listening to loudspeakers right next to your ear. Over-Ear.. Over-hear headphones are large and wide so that they completely envelop the ear and rest against your skull instead. This can enhance noise isolation, making them a great option if you want to listen without audio leakage. However, these headphones are generally bulkier than on-ear options. In-Ear.. In-ear headphones have buds that go inside of your ears. 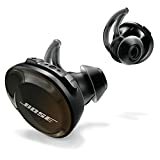 In-ear headphones are extremely portable and lightweight, making them especially useful for people who enjoy listening to music while running or working out. For some, in-ear headphones can be uncomfortable, especially compared with cushioned over-ear or on-ear headphones. There are several pros and cons for each of the form factors depending on what you’re looking for. 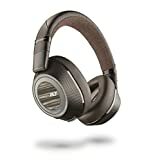 The form factors for the best wireless headphones for your preference will depend on your needs for comfort, portability, sound quality and price. Materials. The best wireless headphones will have sufficient padding made with breathable, anti-sweat materials. Avoid headphones with non-adjustable, plastic headbands. Design. Look for ergonomic headphones that can be easily adjusted to your specific head shape. In-ear headphones should come with multiple ear tip size options to accommodate your comfort needs. Weight. Many wireless headphones, especially over-ear headphones, can be fairly heavy and bulky (although this can also mean better noise-cancelling). Look for lightweight, portable yet secure-fit options if you plan on wearing your headphones for mobile activities. When looking at sound quality, you should familiarize yourself with frequency and latency. Frequencies are what determines the range of mid, treble and bass that you can hear through your headphones. The normal frequency range for most headphones is 20 Hz to 20,000 Hz, with higher-end headphones offering wide frequency ranges. 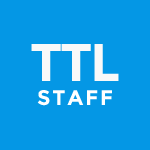 Latency refers to the slight sound delay you may experience when listening to wireless headphones, which may be noticeable while gaming or watching TV. Obvious latency may be more prevalent in earlier versions of Bluetooth headsets. As a general rule of thumb, look for balanced frequencies and updated Bluetooth or wireless technologies for reduced latencies. You can spend hundreds of dollars on a pair of awesome looking headphones, but if the sound quality isn’t good, then you’ve simply invested in a fancy looking paperweight. The best wireless headphones will be made with noise-cancelling technology so you can hear even the most subtle sounds with complete clarity. With superior sound-enhancing headphones, you can use them even in noisy or windy environments such as a café or a park. In the world of wireless, battery life takes the spotlight. Chances are, the whole reason you’re going with wireless headphones is that you want the freedom and portability of a cord-free device. But without great battery life, you’re left with the hassle of constantly charging your headset or buying new batteries. 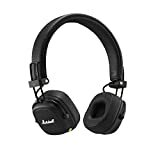 The best wireless headphones should have a listed battery life of around 20 hours (usually you can extend this by managing your usage), but battery life will vary greatly depending on the form factors and style of headphone. Over-ear headphones generally have the most battery life, while in-ear headphones usually need to be charged after 8 hours or so. Overall, the reliability of a pair of wireless headphones will factor in all of the features mentioned above. The biggest aspect of reliability is connectivity; this refers to how your device connects and how well it stays connected. To keep your devices up-to-date, look for wireless headphones with the latest versions in Bluetooth and wireless technologies. The latest Bluetooth iterations will have the best connectivity and ranges so you can enjoy more wireless freedom from a greater distance. 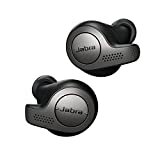 The Jabra Move Headphones are perfect for when you’re taking a walk, riding the train/bus, or even at home or in the office. The ear cups are big enough to cover the ears. This means the sound won’t leak out, so you can enjoy your favorite beats without disturbing anyone around. The headband is lightweight, adjustable (for all head sizes) and well-padded for long-time wearing and you can control music and calls right from the earphones. Furthermore, if you’re out of batter and don’t have a charging station nearby, you can always switch to a wired mode using the included 3.5mm cable. But you shouldn’t run out of battery often with its 8 hours of playtime! Finally, the sound quality is exceptional, and the headphones are compatible with most Bluetooth devices. The HD1 headphones from Sennheiser is a combination of advanced tech and elegance. The design is thought to go with any type of outfits or situations, while the ear cups pack some of the most advanced tech elements to ensure you are able to listen to music or have phone calls wherever you are. It’s true, the price is a bit steep. However, for the money you spend, you get incredible sound quality, high-end materials, and access to Sennheiser’s Noise Guard technology! The latter is what we call active noise cancellation which analyzes the ambient sounds to learn how it needs to adjust the noise cancellation effect. Furthermore, HD1 headphones are equipped with a VoiceMax microphone which cuts off the surrounding noise for you to have crystal-clear phone conversations. The cool thing is that the HD1 has touch controls on the right ear cup and can connect using either Bluetooth or NFC. Sony promises a wonderful outdoor experience where you get to listen to music and enjoy an intimate experience. Their proprietary noise cancellation technology is one of the best on the market, but you’ll also enjoy the modern lightweight design! The sound is clear and spacious and due to the long battery life (up to 30 hours), you can cancel out the surrounding sounds. Furthermore, these headphones are equipped with Smart Listening technology. This means the cancellation activity will be adjusted according to your surroundings. Not to mention, you can use your favorite voice assistant by simply touching your right ear cup. All the controls are touch-based which is quite great but can also be a nuisance at times when you touch them by mistake. Otherwise, the materials are of high-quality and the headband is easy to wear even during long hours. The QuietComfort 35 series from Bose comes with a beautiful design that looks astonishing in any setting. Furthermore, the new noise canceling technology they feature is created to allow people a moment of quiet in the uproar of their day-to-day lives. The controls are placed on the cups, so they’re easy to reach, and the integration with Amazon Alexa makes it possible to give voice commands. The headphones use Bluetooth to connect to an audio source (phone, tablet, gaming console, TV) and the battery offers up to 20 hours of continuous play. The materials used for the headphones, headband, and earcups are of premium quality. This means you will be able to wear them regardless of outdoor conditions. Also, the earcup creates a barrier between your music and the outside world. 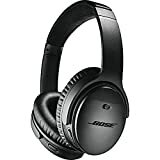 The Bose QuietComfort 35’s settings can be adjusted using the Bose Connect app. Furthermore, the headphones can be used during phone calls, due to the integrated microphone. Comfort, 3 levels of adaptive noise cancellation, and world-class acoustics – these are the features that define the Bowers & Wilkins PX headphones. For comfort, the manyfacturer used premium materials, a comfortable headband, memory foam ear pads covered with leather, and durable ballistic nylon for extra strength. Also, the ear cups swivel, so you can lay them on a flat surface. The ANC technology helps to keep out the environmental noises on three levels (flight, city, and office). Not to mention, if you need to take the headphones off, the music is automatically paused. This way, the battery life (22 hours of active use) is saved. The headphones support advanced Bluetooth 4.1 with aptX HD, and you can use the PX app to control the settings. In terms of sound, you’ll get to live an amazing experience with well-balanced bass and great special differentiation. They may look a bit bigger and bulkier than your average wireless headphones, but this can be an advantage. The headband is heavily padded, so you don’t get bothered after wearing them for a long time, and the earcups are big enough to cover your ears. This way, you don’t need ANC to isolate the outside sounds! Even more, because the cups are a bit bigger, there’s more space for ideal control placement, so you don’t press any buttons by mistake. The battery is also good, with up to 40 hours of battery life. In terms of sound, the ATH-M50xBT features 15 – 28,000 Hz frequency response. The sound they deliver is clear, natural, spacious, and warm. Also, the 45mm large-aperture drivers deliver an accurate and deep bass response. Finally, the headphones support aptX, AAC, SBC, which means you can use them to listen to music, watch a movie, or play a game. They also work great for phone calls, due to the integrated microphone. Did you ever get your workout ruined because your equipment kept getting tangled in your headphone’s wire? Or maybe they were wireless but kept falling off your head. Regardless, the Bose team was inspired by these mishaps and created SoundSport Free. They are wireless and don’t need a headband to stay in your ears. Furthermore, the case used to store them has a built-in charger, which prolongs playtime with 10 hours (5 hours without the recharge). So, you are free to move as you please, while listening to your favorite tunes. And don’t let their compact design fool you! The sound is clear and powerful, just like most people working out love it to be. As proof they were specially designed with active people in mind, they are sweat and weather resistant (Ipx4 rating). Finally, they also come equipped with a dual-microphone (the right earbud), which allows you to take and make calls while wearing them. You also shouldn’t worry about losing them – the Bose app required to edits settings on these earbuds has a feature called “find My Buds”, in case you misplace them. The masterminds behind Elite 65t understood the need for wireless headphones you can wear without messing up your hair. They also understood that we love ease of access. As a result, these earbuds can be integrated with your favorite voice assistant (Alexa, Siri, or Google Now) and have four integrated microphones. So, you can just ask Alexa to switch playlists, amp or drop the volume, or make calls and set reminders. Furthermore, the integrated microphones are fantastic at delivering your voice to the other end of the call without any environmental interferences. The battery will last for about 5 hours of continuous use, but they are delivered with a charging case, which prolongs the life battery with 10 additional hours. The earbuds are resistant to sweat and dust (IP55 rating), so it’s safe to take them to the gym or wear them outdoors. The sound is clear and powerful, but you have total control over how they sound due to the Jabra Sound+ app. You can use it to select your voice assistant, customize the music and even set how much you hear out of the environmental noise. Designed for audiophiles, the H9i wireless headphones feature a gorgeous design and lots of cool features. First, they support Bluetooth 4.2 and wired connectivity (in case you run out of battery), and you can connect them to two devices simultaneously. Not to mention, the range is 121 feet! The sound experience is a dream came true, with deep and natural notes, due to the Bang & Olufsen signature sound technology. Furthermore, the battery will keep going for up to 18 hours, which is quite an achievement! The H9i is also among the few wireless headphones that let you switch the battery on the go. In terms of controls, it can be a bit tricky because you have to learn all sorts of gestures to use the touch controls on the right earcup. Still, once you learn them, it will be easy to switch songs, modify the volume, or play with the hybrid ANC settings. Finally, they have smart battery saving features (pause when you take them off and auto shutdown when not in use for 15 minutes) and transparent mode, where you get to hear the environmental sounds with the headphones on. With 30+ hours of play time and 40mm dynamic drivers that feature an enhanced bass response with crystal clear highs and well-balanced mids, the Marshall Major III headphones are among the best in their niche. Furthermore, the Bluetooth aptX connection supports an exceptional audio quality and freedom of movement due to the 30 feet range. The materials used are of premium quality, which makes the headphones comfortable to wear for prolonged periods of time. They also fold into a compact pack, so it’s easy to carry them around without worrying about their integrity. Even though they don’t have a dedicated app, it’s easy to control the sound quality and actions you want to make due to the special knob integrated into the right earcup. This is the main control for these headphones and supports a series of movements, each assigned to a certain action. To ensure a perfect fit and eliminate any tugging sensation, Bose equipped their QuietControl 30 design with a lightweight neckband. This way, you don’t feel the weight of the earbuds dripping out of your head and you don’t have any issues with tangling wires. At the same time, you don’t have to worry about misplacing your earbuds! The QuietControl 30 from Bose supports Bluetooth and NFC pairing and gives you a 10m radius around the device. It also features adjustable noise cancellation and remote control on the right earbud’s wire. This way, you have easy access to controls for volume, music order, and calls actions. The Lithium-Ion battery provides up to 10 hours of continuous play, and the dual-microphone system is designed to block environmental noise. As a result, your voice will be clear while in a call, regardless of your location. 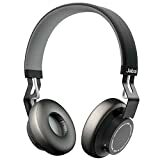 Though a bit bulky in design, the BackBeat PRO 2 from Plantronics is a design that many rave about. And it’s easy to understand why! The headphones manage to deliver rich and immersive audio (crisp highs, natural mids, and deep rich bass). Also, they are equipped with on-demand ANC, to keep the outside noises out while working or traveling. You may also enjoy the 24h battery life and the fact that the music is automatically paused when you take them off your head. Furthermore, the connection will remain strong in the range of about 330 feet from the device! Not to mention, the BackBeat PRO 2 supports two simultaneous connections, meaning you can switch in between devices without worrying about re-setting the connection. Equipped with NoiseGard (Sennheiser’s proprietary ANC), the PXC 550 is designed to improve your travel time. Furthermore, it packs 30h battery life and triple microphone array for phone calls on the go. The materials used to design the headphones are of high-quality and the overall headset is lightweight and comfortable to wear. The PXC 550 is perfect for traveling because it folds into a compact package that’s easy to stash in your backpack. To reduce your interaction with controls, the headset simply turns on when you rotate the earcups from flat to normal. In terms of connectivity, it supports both NFC and Bluetooth 4.2, and both can be reached by using the controls on the right earcup. Even more, the headset can be used with a wired connection should you run out of battery. The entire back of the right earcup is a touchpad which allows you to use gestures to control the volume, music, or answer calls. The PXC 550 supports ANC, which can be turned ON or OFF, using the assigned button. 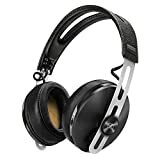 Crossfade 2 is part of a line of gorgeous headphones designed by the well-known V-MODA. These are among the few they created to support wireless mode using Bluetooth connectivity, but they can also be used in analog mode, using the removable cable. 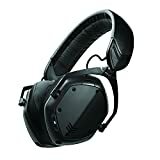 In wired mode you can use them in professional studios or for activities that are usually challenging for wireless headphones (gaming or watching videos). Also, the 50mm drivers and dual-diaphragm deliver unmatched sound quality in both wireless and wired modes. The design and sound they deliver are widely appreciated by renowned publications all over the world. The earpads use memory foam cushioning that increases comfort and improves isolation and the materials used are highly durable. The headband is heavily padded, but it still allows air to flow, for better ventilation. The battery will let you enjoy up to 14 hours of constant playtime. Also, the headphones are delivered with a tough and compact travel case, that is packed with accessories (charging cable, earplugs, USB cable, and more). With the right pair of wireless headphones, you can enjoy the audio of your games and music while you’re running, exercising, traveling, working or relaxing at home. Whether you prefer the familiar style of on-ear headphones, the noise-cancelling capabilities of over-ear headphones or the convenient movability of in-ear headphones, there’s plenty of options to suit your needs for comfort and budget. For gamers, musicians and media enthusiasts looking for the best Bluetooth speakers, noise cancelling headphones, earbuds or wireless headphones, it all comes down to what works for your individual lifestyle. 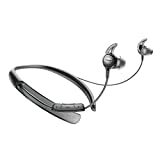 The Backbeat Pro 2 special edition has smart sensors that pause the music when the headphone you detach from your head. If you put it back on, the music immediately resumes where it has stopped. I always prefer small sized in ear earbuds. Using Rowkin for last few months. I’d love to recommend it for anyone. They’re just perfect.